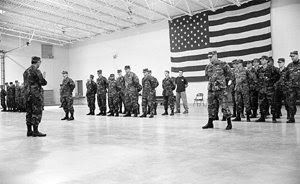 The headquarters unit of the unit stands in formation at the beginning of each day. - The men work hard to learn to perform their duties properly. What is it that they actually do? Fire! The soldier pulls a cord, which triggers a shotgun shell in the breech, igniting the powder and firing the shell. It takes a lot of preparation and teamwork. In addition to the six soldiers seen here, there are two with the ammunition, one with the gunpowder, and at least one more assisting in other procedures relating to the firing of this one 155mm howitzer. 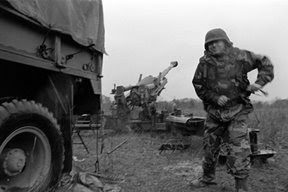 - Loading and aiming the howitzer is a series of precise steps, often occuring simultaneously. It's not always a hurry. 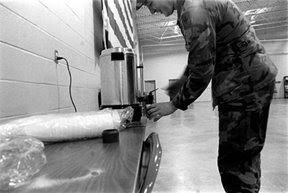 Coffee is an important part of the training exercise, and is always on hand in ample amounts. - Speed can't always be achieved; the men train to improve operational quality. There's an element of adventure. The men load large amounts of equipment into the Hummers for the long road trip from the armory to the firing range. - The adrenaline begins to flow when the fire mission message comes from unit commanders. But there's also the mundane. Each Hummer gets about 10 to 15 miles to the gallon, but their tanks hold enough for long trips. Even so, they need to refill. 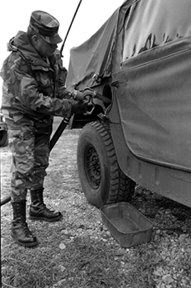 Army environmental regulations require a container be placed to catch any gas spillage during fueling. - Military-issue clothes are always being issued and improved upon. The weather doesn't always cooperate. 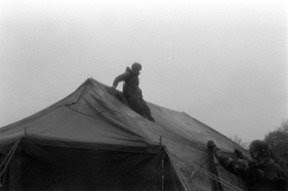 A soldier slides off the soaking-wet roof of a tent after covering a hole in the tent canopy. Patience and coordination are a must. Halfway from the armory to the firing range, the convoy takes a rest stop to switch drivers and stretch their legs. - Reloading is never easy. 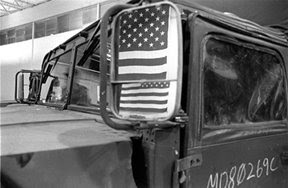 The battery's large U.S. flag is reflected in the poorly-aimed rear-view mirror of a Hummer. - Instructions are given repeatedly, until they are learned by rote. 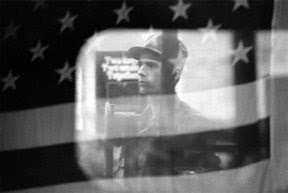 A soldier stands silhouetted by the rear window of a Hummer in the reflection of an American flag on the Hummer's windshield. The Headquarters Battery, 128th Field Artillery, Missouri Army National Guard trains one weekend a month and two weeks a year. The members of the unit lead dual lives: as soldiers and as citizens. 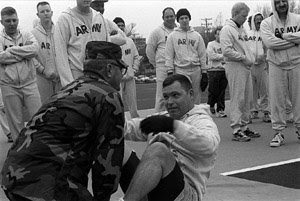 Demonstrating a regulation Army sit-up, Sergeant First Class Chris Jones play-boxes with his friend, Sergeant First Class Dave Robbins. The rest of the men enjoy the levity. It's 7:30 a.m. They've been up for at least an hour. The exercise, a mock fight at a local training area, lasts about 15 minutes, but it was compressed in the minds of the men, who want to do it all again. "Let's play more!" a couple of them say. OPFOR has been defeated, their position overrun by hard-charging, fast-firing defenders. It's not just a bunch of guys jumping in Jeeps to go play laser tag. This is the military. Despite how much they train for war, weekends like this are really the only time these Guardsmen get to be soldiers in combat. Most of their time on active duty is helping civilians somewhere in Missouri. Like civilians, they enjoy a cold beer at the end of a long day. This weekend, Robbins obliges with a half-keg, in honor of his final drill. It's gone before the men go home to sleep for the night. Those whose homes are several hours away bed down in the armory. When the battery is dismissed Sunday afternoon, most of the men crowd around Robbins to congratulate him on his service. When the crowd has just begun to die down, another section of the unit drives up. Robbins is back on the job only five minutes after being told he's done. He checks quickly to make sure the situation is under control, and then heads out the back door of the armory with a few of the men. In the bed of Robbins's white pickup truck is a cooler of beer. Cigars are passed around; Command Sergeant Major William Rich lights Robbins's. The air is festive but a bit sad. Robbins himself doesn't quite know what to think, but he's smiling and puffing away on his cigar, laughing with his comrades in arms. Spies reminds the group that most of them are here not for the money ­ though the money is nice ­ but for the company, the comradeship. Rich says that of his ten best friends, he met seven in the Guard. Robbins promises everyone he'll be back to visit; they assure him they'll miss him when he's not around. 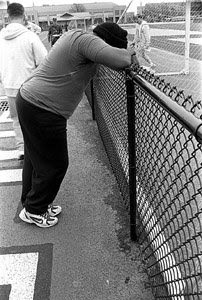 Sergeant Dale Sheley leans against the fence after hitting the wall during the two-mile run. He finished faster than he had to, but he paid the price. It wasn't as bad as other times: some soldiers have crossed the finish line and run straight into the shrubs to throw up. 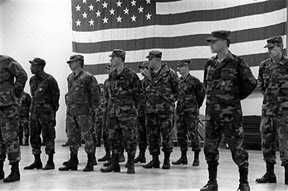 Saturday morning, their routine is very basic: do a certain number of push-ups, then a certain number of sit-ups, and then run two miles in the time the Army allows. It's called a "PT test" ­ physical training. The men, in sweat clothes clearly labeled "ARMY," are in varying stages of readiness for the test. Some are taking this "for the record," to be officially noted in their service log. The rest are taking it to see how they measure up to the new Army standards, which take effect in October and are a step up from the old ones. They do their push-ups six abreast, each with a sergeant keeping count. Sergeant First Class Dave Robbins is the most vocal of the bunch: "Give me sixty-five, sir! SIXTY-FIVE, SIR!" he bellows, his voice splitting the early-morning air, attracting stares from the few civilian runners out for a jog around the track. In a pressed camouflage uniform complete with extra-shiny combat boots, Robbins is the genuine article. Robbins coaxes, chides, or forces the best out of the men doing push-ups in front of him. He does the same when the sit-ups come around. The run gets under way and he urges the men to run faster, though more quietly now. It seems he's saving his voice. As they get close to the end of the two miles, he's bellowing again, demanding performance from these men, his friends and fellow soldiers. Some of the soldiers laugh, but most smile quietly. He is respected around here; he's been in the Guard twenty years. He was in the Navy in Vietnam. He has a wife and a daughter. But this morning he is all military. Which is not to say he's impersonal or unfriendly. It's just a way of being respectful without giving up a sense of personal responsibility for what's happening. Robbins is intense, even though tomorrow will be his last official day in camouflage: He's retiring. 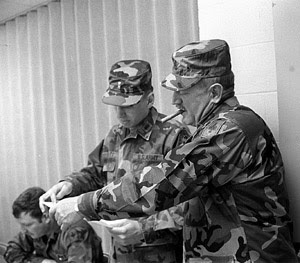 Sergeant First Class Dave Robbins confers with First Lieutenant Brian Everitt about the afternoon's trip to the Rocky Forks State Park firing range. Several men must go to maintain thei weapons qualification. Others are going for the opportunity to practice firing M-16s. Still others are going because they like to shoot. Robbins makes sure the list is correct. Robbins is in charge of the shooting area. The Guard uses the public range at Rocky Forks State Park. 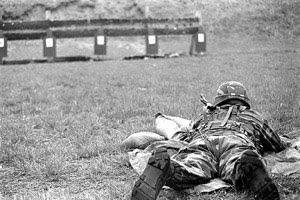 Camouflage-clad men in prone positions are arrayed on the ground on one side of the range, shooting M-16s at Army-issue targets; on the other side men, women, and children in jeans and baseball caps fire a powerful arsenal of handguns, shotguns, and high-powered rifles at soda cans and hand-drawn bulls-eyes. Beer and ammunition flow freely on the civilian side; nobody on the Guard side touches his M-16 without specific instructions from Robbins. Weapons are pointed down-range at all times; before anybody walks down to check the targets, Robbins and his two safety assistants must see that all rounds are expended and that the weapons' safeties are engaged. It's a strict rifle range. The Navy would call it "ship-shape." Robbins calls it "my range." He chews on his cigar as the men take aim, inhale, exhale slowly, and pull the triggers on their rifles. This is training. If it were combat, the men would be shooting more rounds, faster, and Robbins wouldn't be walking them through the process. He's proud of the way he runs a rifle range: "Everybody qualifies. If they're out there shooting, they're going to stay there until they qualify." The men qualify. Some head out the very next day to practice in a mock battle. Afterwards, they take a break to talk a bit about the exercise, but now it's time to clean up. This is the 1990s Army ­ environmentalism is important. The brass shells expended by the M-16s are valuable. They're easily recyclable, while making new brass is expensive. The Army has also found a military reason: Leaving behind signs of your presence gives valuable information to the enemy. Never mind that an enemy which has successfully captured this midwestern training ground already has a good idea of what kind of ammunition M-16s use. So back the men go, revisiting their locations during the recent firefight, to pick up as much brass as they can. At the firing range, it's up to the individual. Each soldier fires his weapon to make sure his aim is correct. Then the target shooting begins for real. Though M-16s can be fully automatic weapons, they are set to shoot one round at a time on the range. Of the forty rounds each man shoots, nearly all hit their targets. During the exercise, individuals are important. Specialist Anthony Ash had a radio strapped to his chest when the fight began. It's not there now. After a few minutes of searching, it's found, in the place Ash first hit the dirt to fire his M-16 at an intruder. He's chagrined and refuses to carry the radio back to the vehicles, for fear of losing it a second time. "He's got it, and I'm not going to touch it, sir," Ash says dejectedly to Spies. Despite that the radio was clipped to Ash's vest, Spies gives him a break. 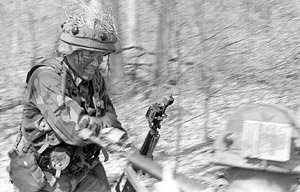 The unspoken feeling is that a "real soldier" wouldn't have dropped the radio in the heat of battle. It is, though, the sort of thing which could very well happen in combat. It's just a lot less desirable there than here. Individuals are respected in the Guard. Individual contributions rarely go unnoticed or unremarked. This month, final formation begins after everyone has returned their weapons and MILES gear. Various announcements are made, and then the real event begins. Captain Spies's voice rings out in the immense room. "Sergeant First Class Dave Robbins, front and center." Robbins exits his place in the ranks and marches up to stand at attention in front of Spies. It is his last day in the Guard ­ his last few minutes now. Spies speaks again. "Gentlemen, before me stands the example of the citizen-soldier." Spies talks briefly about Robbins's service to the Guard and the level of performance the veteran demands from his fellow soldiers. Robbins's wife has already been given an award for her support of the Guard and her husband's career. Now Robbins himself gets a service medal and letters of commendation from U.S. President Bill Clinton and Missouri Governor Mel Carnahan. He is trying not to cry. Spies is trying not to cry. First Sergeant Carney, who is reading the letters aloud to the men, is trying not to cry. When he is permitted, Robbins runs back to his place in line so the men don't see his tears. The new medal falls off while he runs; he stops quickly to pick it up. When he gets back to his place, the man next to him slips him a handkerchief. For the first time in twenty years, Robbins won't be back next month to be a soldier again, even for a weekend. The rest of them will be back. Some will see each other tomorrow; others will have to wait the full month. They part ways smiling and waving, not quite ready to return to their homes and their civilian lives. Staff Sergeant Alvin Sheard checks equipment back ino the supply locker. He says he knows the whereabouts of each item in his inventory. Food in the Guard is a completely military affair. MREs (Meals Ready to Eat) are standard fare, though the soldiers have to pay just over $3 per MRE during drill weekends; if they're called into service, the food is provided for them. Most pay and then complain about the quality of the product. They choose their lunches, paying careful attention to the labels: beef stew is good, ham and cheese omelets are awful. "Eat. Don't eat. Eat. Don't eat. Don't eat. Don't eat. Oh ­ these are good." Sergeant First Class Chris Jones, the unit's recruiter, sorts the contents of his MRE. When he's done, there's as much discarded food and plastic wrapping as there was food he ate. The rations aren't terrible; each meal contains 7,200 calories ­ enough, the Army calculates, to sustain a soldier in the field on the contents of one meal pack per day. One of the unit's ex-Navy guys remembers fondly his days of "C-ratch", Canned Food, the Navy's version of an MRE. But he grins and eats, too. Each man has a specific job. While they all have a general sense of purpose and mission, the men trust each other to accomplish the necessary tasks. 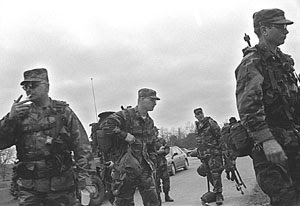 As the unit prepares for exercises, collection of gear, location of men and supplies, and organization and safety are at the forefront of the leaders' minds. We've all seen the ads: "One weekend a month, two weeks a year, the Army National Guard." We don't hear that many members of the National Guard take only two weeks of vacation from their jobs every year ­ and those they spend training with their Guard units. We don't hear that at 5 a.m. one Saturday morning each month, the men and women of the Guard roll out of their beds, drive to their local armory, and are standing in formation at 7 a.m. for the day to begin. We don't hear that the following day, they do the same thing again. Or that the following month, one weekend is already booked. Or that some members of the Guard do this for twenty years or more. As the exercise begins, some of the men learn to use a new mine detector, like the ones in use in Bosnia right now. A squad goes off down the road to test it. One man holds the mine detector; two others walk behind him with weapons held ready for any potential attack. 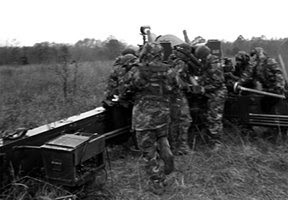 About seven of the group fade off into the woods, to prepare for the exercise. They're called OPFOR ­ "opposition forces" ­ and will attack the main group at some point a bit later in the afternoon. The rest of the men will practice moving into a new location and setting up a headquarters base there. First they sweep the road for mines; then they secure the perimeter in a silent operation using only hand signals to communicate. The men move quickly ­ though not too quietly ­ through the forest, on the lookout for enemy troops and booby traps. It's eerie, a silent defense against unseen aggressors. It's almost possible to believe there's a real enemy out here, somewhere in Macon, Missouri. When the perimeter is almost secure, OPFOR attacks. Two men move in from one side of the road; three others appear further down the same side of the road. But where are the rest? The defending men open fire, running, dodging, and diving through the brush to get better views of the aggressors while still protecting themselves. Some of the men, who were scouting the other side of the road, come over to help in the fight. Others stay where they are, guarding against any other possible attacks. The rest of OPFOR opens fire, now that forces are committed away from them. They are next to the road, in a clump of trees, on relatively high ground. Spies and Carney hang back, letting the men fight. They're commanders, who need to stay alive as long as they can, to coordinate the counter-attack and communicate with other units. The fight lasts about 15 minutes, but it was compressed in the minds of the men, who want to do it all again. "Let's play more!" a couple of them say. OPFOR has been defeated, their position overrun by hard-charging, fast-firing defenders. Despite how much they train for war, weekends like this are really the only time these Guardsmen get to be soldiers in combat. Most of their time on active duty is helping civilians somewhere in Missouri. This weekend they don't get to fire "the big guns," like they do during their two-week annual training. Sergeant First Class Joe Reddick, who did 99 push-ups (his personal record is 150 in 2 minutes), works in the impact zone, where the shells come down. He's a full-time member of the Guard, meaning he also works forty hours a week in the Armory helping the unit stay organized. The full-timers are a smooth office team. They get their work done mostly on time, banter extensively, and keep abreast of each other's personal lives, just like any other office staff. Except they wear camouflage to work every day. And their workplace is vacant most of the time, though on drill weekends the place is hopping with what the Guard calls "traditional soldiers" ­ citizen-soldiers. These people are not the full-time Army, which does "more before 6 a.m. than most people do all day." Neither are they the Army Reserve, which is only on-call for the Pentagon. The National Guard has a dual mission: federal military service, and state emergency service. They get more done on an average drill weekend than most people do in a whole week. 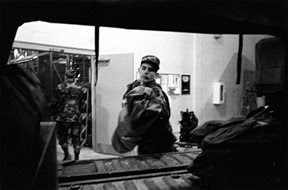 As they return to the Armory from the rifle range, the First Sergeant approaches, asking them to donate blood. The Red Cross holds blood drives during some drill weekends; 100-odd able-bodied healthy men in one place is too much for them to pass up. They hoped to get 25 pints of blood on Saturday afternoon, but Carney's pleasantly cajoling recruiting effort got them 27 pints. In the heat of simulated battle, cooperation and communication are the keys to survival. Working in teams, the men practice silent communication, checking an area for enemy troops or traps, and practice defending against an attack on their headquarters area. 7 a.m. Sunday. First formation. Some soldiers are late because this is the weekend the time changed one hour forward. Carney forgot to mention it at yesterday's final formation. He's fuming. Most of the men checked out their weapons and MILES gear the day before. "MILES gear" is the Army's term for "laser tag equipment." It's heavier and bulkier than the commercial version, attaching to the rifles and to the soldiers' helmets and upper bodies. Each man's total burden is 60 pounds. Captain Spies is waiting for the briefing, too. He's in charge of the detachment going up to the training area. "My unit hasn't been in the field for a while," he says. "They're a bit rusty. But I refuse to get agitated. I'll just let the First Sergeant sweat a bit. That's his job." Carney is definitely sweating. He's about to start the safety briefing and now he can't find Spies. Everyone else is almost ready. The one man who didn't want to go on the trip isn't coming. He's found himself at the receiving end of a "Robbins Attitude Adjustment," though, which is price enough to pay. At last all the Humvees have enough gas, and the ones that don't start have been exchanged for ones which do. Carney begins. "I'm going to forget that I planned this briefing for 0800. I'm going to forget that it's now 0826. I'm going to forget that you were all supposed to get gas for your vehicles yesterday afternoon. I'm going to forget..." The litany of the morning's errors continues. 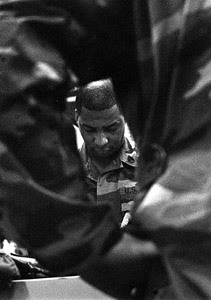 Discipline here is military mixed with civilian: harsh criticism tempered with positive group-dynamics techniques. "We move on from here. This is a safety briefing." It is not about the dangers of playing laser tag with M-16s while wearing full camouflage (including face paint) in a heavily wooded area which is pretty wet from recent rain. Instead, Carney delivers a lecture on the hazards of getting to the training ground. "We're going to be traveling on highways varying from two lanes to four lanes, with speed limits varying between 60 and 70 miles per hour." Vehicle following distances are carefully specified, in meters, of course ­ this is the Army. If any vehicle can't see the one behind it, it must slow down. Everything is prescribed: "You assistant drivers are there to keep your drivers alert and awake. Make sure you do this." Everybody wears seatbelts. Vehicle headlights are on for safety. Even plans for vehicle breakdowns are outlined. 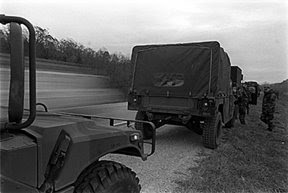 The convoy is registered with the state National Guard headquarters; the registration number is chalked on the side of every vehicle. The Humvees and trucks pull out onto the highway. Though the speed limit is 70 m.p.h., the convoy's top speed is 50, in the slow lane. Other drivers take every opportunity to pass, leapfrogging dangerously up the convoy between Humvees. Civilian drivers ­ who definitely could have used that safety briefing ­ almost cause two accidents as the convoy lumbers north. Exiting the highway onto a dirt road, the convoy finds the going wetter and tougher by the mile. Soon the Humvees' massive wheels are thickly caked in mud. Civilian cars don't have a hope of making it; the lone pickup truck venturing down the road slides and spins for a bit before getting moving. The mud-spattered convoy parks in a clearing for lunch. The battery in formation in the drill room of the Armory. The unit has long-time veterans as well as newcomers, some of whom lack uniforms. First Sergeant William Carney reviews the weekend's successes and shortcomings, announces upcoming events, and ensures that as each soldier returns home, he knows where he will be during next month's drill. Battery First Sergeant William Carney announces the order of the day. Arrayed in front of him are just over 100 men, and no women. This is a combat unit; women aren't allowed here. Ninety percent of their training is for combat duty. They are the headquarters unit for the regiment, which is made up of National Guard batteries all over Missouri. In time of peace, these men are ready to serve Missouri for disaster relief, riot control, maintenance of public order, or, most recently, flood control. Staff Sergeant Melvin Wriedt remembers the flood of 1993: "A lot of inventions came out of that flood. One was the automatic sandbag filler. It has a hopper and a spout. You hold the bag up and pour. It's better than 'one man hold the bag, one man dig.'" Ten percent of their training is for this type of public service. Some of these men have worn other uniforms before, in the Navy, in the Army, or in the Marines. "We collect all types. We're not picky," says battery commander Captain Harold Spies, who did 67 sit-ups. This unit dispenses with the traditional armed-forces rivalries. They're all artillerymen now. The men of the unit wear their Guard membership on their license plates. The military and civilian worlds combine in curious ways in the National Guard. Students young and old are in this university-town unit. Some, like VanZandt, are getting advanced degrees in accelerated programs. Some are working on their college degrees. The newest members haven't yet graduated high school. Civilian life appears elsewhere, too. Staff Sergeant Paul Hegg's daughter is a Girl Scout. He sold over $400 worth of cookies to members of the unit, hand-delivering them out of a huge cardboard box during breaks in the weekend's events. Specialist Steven Walker collected his four boxes, saying, "I'm so happy ­ I've got my breakfast now."